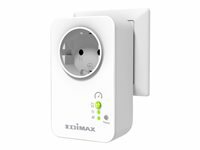 The Edimax smart plug switch with power meter connects people to their homes, and the things they use every day. Designed to make homes more dynamic, functional and work better for modern lifestyles, smart plug products give users intelligent control over all of their home electronics. The smart plug switch power meter plugs into any wall socket and enables you to switch or schedule a connected electronic device on/off from your smartphone, and the embedded power meter allows you to monitor and manage power usage. Power can be set to automatically switch off when a user-defined usage limit is reached, and the power meter can also send notification emails about alarm events.